Celebrating our 10-year Anniversary in 2016! 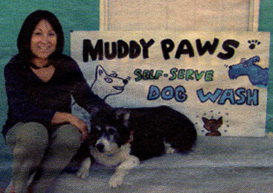 I was literally thrown a life-line when I created Muddy Paws Bath House. In 2006 I was diagnosed with breast cancer for the second time. My oncologist told me I may need to change my profession. I am a professor of political science and during this particular time teaching politics was very stressful. I had no idea what I could do with a Ph. D. in politics, but I knew something would come to me. Little did I know, my future journey with dogs had already been planned by my earlier activities. In 1998, I organized about 70 of my closest Highland neighbors in an attempt to create off-leash dog parks in Denver; the City of Parks had none. I met with Mayor Webb, wrote the proposal and five years later our dreams were realized. Prior to creating Muddy Paws I would wash my dogs at home or at places where the tubs were not circular, making it difficult to wash the other side of my dirty dogs. It came to me. I should open a self-serve dog wash in my community and make it more functional. So while I was going through chemotherapy and other various cancer treatments I designed, built and operated Muddy Paws Bath House. The groomers came later. Consequently, I became less stressed and was able to run the business, heal myself and stay in my profession. Dogs are so decompressing. I focus on quality of service not quantity. In addition, unlike most owners I am not dependent upon my business for my personal income. This allows me to do what I additionally enjoy: organize fund-raising activities for shelters, and other dog-related non-profits—and I’ve had numerous fund-raisers from art shows, to food drives, to yard sales. Muddy Paws has also organized dog park clean-ups so we don’t lose the parks we worked so hard to get. So I am intimately connected to the pet community and its needs. Please click here to read an inspirational interview with Zia by the Denver Post!